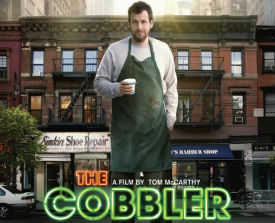 The makers of "The Cobbler" movie have filed a lawsuit at a federal court in Oregon directed at 11 users of the popular Popcorn Time software. According to the filmmakers Popcorn Time doesn't have any reasonable legitimate use, something of which the users should have been aware. Over the past several years hundreds of thousands of Internet subscribers have been sued in the United States for allegedly sharing copyrighted material, mostly video. The cases are generally targeted at “BitTorrent” users in general, not focusing on any client in particular. However, this week the makers of the 2014 comedy “The Cobbler” decided to single out Popcorn Time users. Popcorn Time also uses BitTorrent under the hood but unlike traditional clients it allows users to browse through a library of films and stream these from within the application. Popcorn Time is by no means private as users connect to public BitTorrent swarms, which makes it easy for monitoring firms and copyright holders to track down pirates. 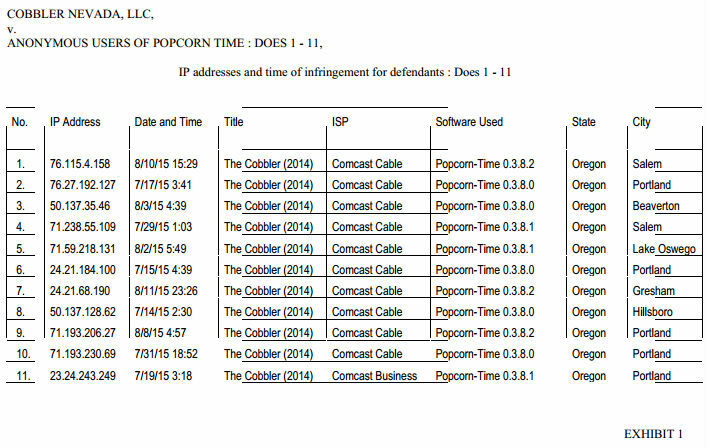 This also happened to 11 Popcorn Time users who allegedly viewed and shared “The Cobbler.” The makers of the movie filed a complaint (pdf) at a Oregon District Court requesting a subpoena to compel Comcast to hand over the personal details of the associated account holders. “Each defendant’s IP address has been observed and confirmed as both viewing and distributing plaintiff’s motion picture through Popcorn Time,” the complaint explains. The reason for singling out Popcorn Time users is unclear. The same filmmakers have launched lawsuits against BitTorrent users before, but they may believe that the infringing image of Popcorn Time bolsters their case. “Popcorn Time exists for one purpose and one purpose only: to steal copyrighted content,” they write, adding that the defendants should have been well aware of this. The Popcorn Time website and application repeatedly informs users that its use may be against the law. For example, the Popcorn Time website has a clear warning on its homepage and in the FAQ. “Without a doubt, each user of Popcorn Time is provided multiple notices that they are downloading and installing software for the express purpose of committing theft and contributing the ability of others to commit theft by furthering the Bit Torrent piracy network,” the complaint explains. The filmmakers demand a permanent injunction against the defendants ordering them to stop pirating their movies. In addition, they request statutory damages of up to $150,000. In reality, however, they are likely to approach the defendants for a settlement offer of a few thousands dollars, as is common in these type of “copyright troll” cases. The developers of the Popcorn Time app that was targeted inform TF that users are indeed repeatedly warned that using their application to download pirated films can lead to legal trouble. “Popcorn Time isn’t illegal. However, the use people make of the application can be illegal, depending on their country and local laws,” they tell TF. The Court has yet to issue an order following the subpoena request. Based on previous cases the account holders connected to the 11 IP-addresses listed above can expect a settlement offer in the mail soon.